***GRADE A STUDENT AT A LEVEL*** ACE YOUR A LEVELS with my grade A revision notes! Here you can find everything you need for the MEDIA WJEC A level course and the ENGLISH AQA A level course! 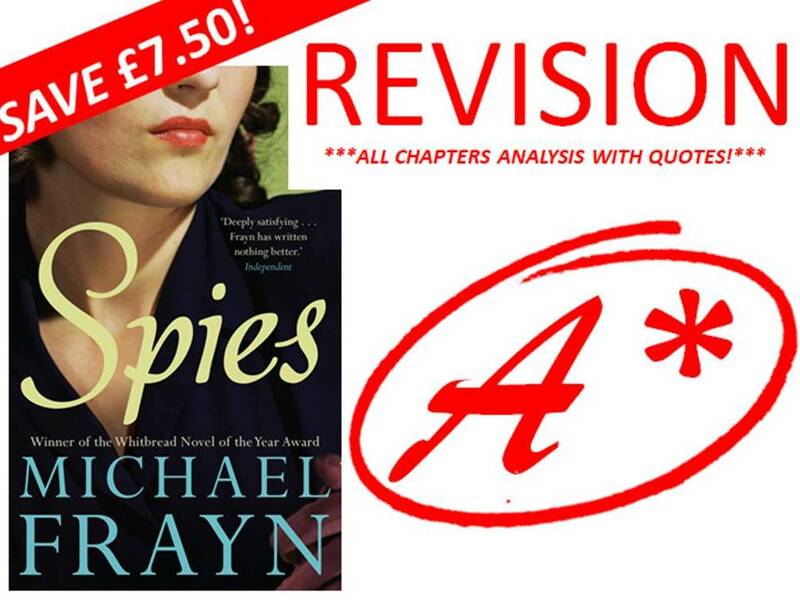 DETAILED CHAPTER ANALYSIS WITH QUOTES Use these notes to revise chapter 5 of spies. They tell you everything there is to know, as well as picking out key quotes to accompany the analysis! DETAILED CHAPTER ANALYSIS WITH QUOTES Use these notes to revise chapter 7 of spies. They tell you everything there is to know, as well as picking out key quotes to accompany the analysis! DETAILED CHAPTER ANALYSIS WITH QUOTES BUNDLE SAVE £7.50! The ‘Spies’ by Michael Frayn REVISION BIBLE! Use these notes to revise ALL 11 CHAPTERS of spies. They tell you everything there is to know, as well as picking out key quotes to accompany the analysis! Buy this bundle of ALL the chapters and save £7.50 of the total price if you were to buy all my Spies chapter revision notes separately! GREAT saving and an EVEN BETTER resource! 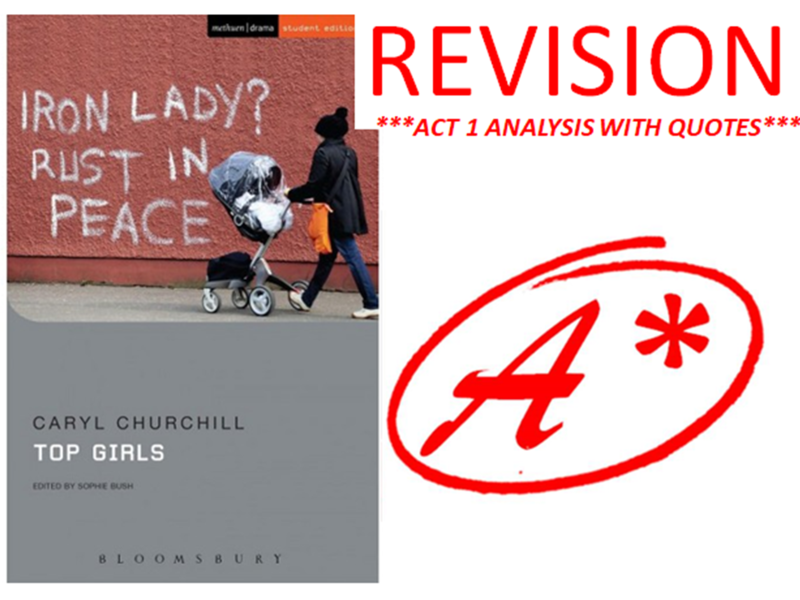 TOP GIRLS BY CARYL CHURCHILL ACT 1 REVISION WITH QUOTES! Everything you need to know about Act 1 of top girls, full analysis WITH QUOTES! DETAILED CHAPTER ANALYSIS WITH QUOTES Use these notes to revise chapter 6 of spies. They tell you everything there is to know, as well as picking out key quotes to accompany the analysis! 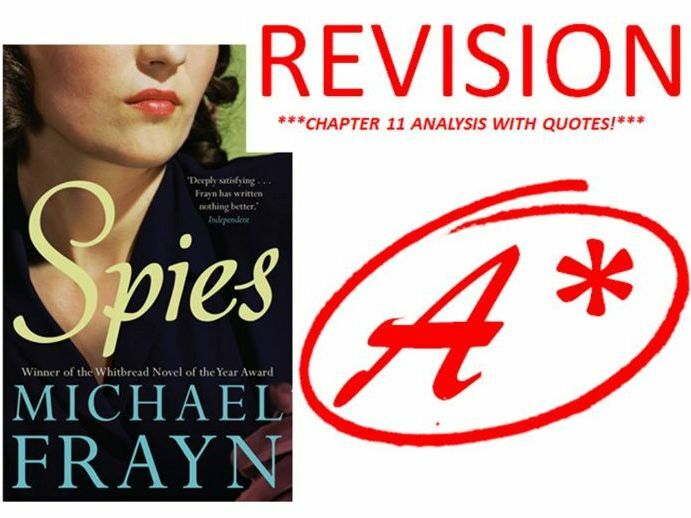 DETAILED CHAPTER ANALYSIS WITH QUOTES Use these notes to revise chapter 11 of spies. They tell you everything there is to know, as well as picking out key quotes to accompany the analysis! DETAILED CHAPTER ANALYSIS WITH QUOTES Use these notes to revise chapter 8 of spies. They tell you everything there is to know, as well as picking out key quotes to accompany the analysis! DETAILED CHAPTER ANALYSIS WITH QUOTES Use these notes to revise chapter 9 of spies. They tell you everything there is to know, as well as picking out key quotes to accompany the analysis! DETAILED CHAPTER ANALYSIS WITH QUOTES Use these notes to revise chapter 4 of spies. They tell you everything there is to know, as well as picking out key quotes to accompany the analysis! SPIES by MICHAEL FRAYN CHAPTER 1 &amp; 2 REVISION DETAILED CHAPTER ANALYSIS WITH QUOTES Use these notes to revise chapter 1 &amp; 2 of spies. They tell you everything there is to know, as well as picking out key quotes to accompany the analysis! 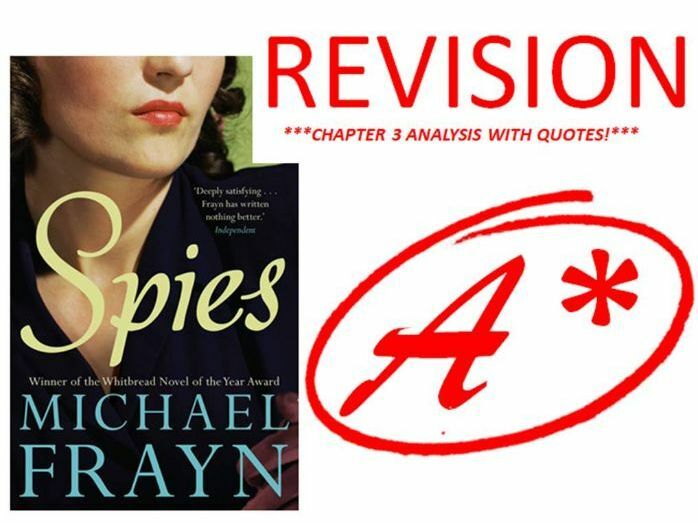 SPIES BY MICHAEL FRAYN CHAPTER 3 REVISION DETAILED CHAPTER ANALYSIS WITH QUOTES Use these notes to revise chapter 3 of spies. They tell you everything there is to know, as well as picking out key quotes to accompany the analysis!